Did you notice the unit number? …I’m going to let it go. …and that was that. My husband could exhale. The 3 digit unit number for our potential new condo added up to 13. A possible deal breaker. Theoretically. Based on past history. I won’t even book plane seats in row 13. I hold fast to the significance of there being almost exactly 3 months between the birth dates of my husband, my 2 children and myself. And that my birth date involves multiples of the same number. The symmetry of their birth date numbers (all containing an 8) offers a strange comfort…which I have never questioned. I was the first child of 5, born into a family of 7. Odd numbers. Still pondering that. When bad things happen, I’m not surprised when the 3rd follows the first 2. Even – rather than odd – numbers just make more sense. After all, you have 10 fingers. 10 toes. 2 hands. And so on. At least that’s the plan, if you’re born lucky. When we bought our first home in 1980 and realized the house number matched what had been our first apartment number, I knew it was meant to be. And it was. However…36 years later…in 2016…I could not make the rest of our lives contingent on such things as…numbers. And, one might say, superstition. Fortunately the square footage numbers added up to 17. A small boy dashed from one puddle to another…his voice pitched high with excitement. His wispy blonde hair matted from the downpour. He jumped back from the edge of the concrete steps…onto the lawn. The ground soaking wet. He hopped. One foot. The other foot. Arms waving. He stopped. Gaze fixed. On the grass. The garden. The fence. Through the rain drops. Watching. And listening. The summer shower hitting the porch. The roof. Dripping down his forehead. His nose. He blinked fast to clear his eyes. Short legs planted firmly. Arms spread wide. Another hop. A small jump. A twirl. Fingers patted the evergreen bush. The ground spongey. T-shirt stuck to his tummy. Shorts soaked. Splash…one blue sneaker. Splash the other one. A two-year old’s happy tap dance. A smile plastered in place. Do you like the rain?.. Where’s the rain coming from, buddy? Little wet hands reached out. He paused. Pointed and…turned to his parents. I emptied my basket onto the conveyor belt. Milk, orange juice, salad, tomatoes, bananas. A quick trip to the grocery store. My purse open, digging for my wallet, I looked up. Still searching for a ten dollar bill, I mumbled…. She began filling my blue canvas bag. You don’t look old enough to have children that age! You must have had them young. I was 40 when I had my son. I didn’t think I was going to be able to have any children. Wow that’s hard to have a baby at 40. Yes it is!…Have a nice day! I had never seen her before in my life. This happens often. Random, sometimes personal, conversations initiated by complete strangers in the grocery store. I wonder why. Do I look smart? I’m not that smart. I really don’t know why detergent pods can leave holes in your laundry. But apparently I can commiserate as to why Proctor & Gamble won’t make it right. Is there really an age-appropriate way to look…after raising 2 “old” adult children? Let’s face it – the story of motherhood is unique to every woman. How much we all age – or appear to age – is the sum total of many experiences (…never mind genetics and health). Motherhood does jump start the process. From day one…when you may stumble around bow-legged like you’ve ridden a horse for too long…after birthing an almost 10 pound first child. Swearing there will be no more. Until you change your mind. I will admit…motherhood carves out a chunk of your heart and holds it forever. It also forces you to grow up. For real. The shock – to your entire system – of a love so epic. Slamming into a whole new reality: It’s not all about you anymore. The Rite of Passage to end all others. Before parenthood, your self…still rough around the edges. There is real pain along the way. The birthing. The sleepless nights. Sleepless days. Endless decisions and acts of faith. You didn’t know you had. Embracing the joy. The fun. Searching for answers. Finding courage. Hoping you know what the hell you are doing. Because you love them so damn much. Even when they cut away and move on. Much stronger than you ever dreamed. More than ready…if you’re lucky…for the next level. Things my father (or any male of influence growing up) said. Are we here to eat or play cards? You haven’t got a ghost of a chance. Throw one away you won’t have so many. Always accompanied by my grandfather’s litany of patter. To keep squirmy card players at attention. Snack crumbs to a minimum. Playing cards unbent. Always with a smile; however small, tugging at the corner of his mouth. The corner not clamped tight on a lit Pall Mall. The smile winning out at the last directive – discharge in lieu of discard – to get a rise out of my mother who was predictably horrified every time. Snickering ensued amongst the rest of us. Every time. My grandfather – Opa – was a talker. A rabid card player. And so was I.
I was 21 and had just started seriously dating the man I eventually married 3 years later. I was home that March on my college spring break…and spent a weekend visiting Opa and Oma. As we shared a booth waiting for pizzas at a local restaurant, he sat directly across from me. Oma was on my right. The conversation shifted from his questions about my nutrition classes…to questions about my romantic boyfriend. Who had sent a dozen yellow roses. To me. At their house…FTD! Uh, huh…? He’s going to be a music teacher when he graduates this year. Okay that’s good. Opa’s expression at this point relaxed somewhat, but remained neutral. I suspected he was hoping I was in love with someone who would earn lots of money. Obviously that wasn’t going to happen. Never mind what my career would bring…but I was a year away from graduation at that point. Shifting in his seat, he leaned forward. Looked straight at me, his glasses sliding down his nose. His blue eyes bored into mine. Immediately Oma kicked him under the table. Muttered his name in a warning. Never breaking his gaze. Uncharacteristically serious. I nodded. Not really embarrassed, I kept my reaction as noncommittal as possible. He didn’t want me to repeat his history. Opa was beyond excited at the prospect of becoming a great grandfather. When I was expecting my first child, he would check in with me every so often to ask about my health. And plans for the baby. Including what the baby’s diet would be. I told him I was planning to exclusively breastfeed. He was thrilled. Your Oma breastfed your mother for a year! If You Breastfeed Her For The First Year Everything Will Be Fine! Part of teaching is helping students learn how to tolerate ambiguity, consider possibilities, and ask questions that are unanswerable. We ask them all the time. Naively. Believing answers are forthcoming. Nice, neat, tidy answer boxes we can check off…putting our minds at ease. Humans need explanations. Logical reasons for behaviors…and difficult situations. Doubt disturbs the equilibrium we crave. Why can’t I touch the stove…run into the street? Why are those kids so mean? How come grandpa had to die? As time passes, the answers thin out. They don’t cut it. We see through them. The holes. The exceptions. The weaknesses. The path to newer questions. Black and white fading to gray. In the end…sometimes no answers. Not really. We’ve lived too long to settle. We know better. But still…not why. Why is she sick with cancer and I’m not? Why can’t the doctors figure out what is wrong with me? Shifting realities pose more questions than answers. Humans don’t fit neatly into a category of reasons why. Too much mystery. Too many unknowns. Intangibles. What happens when I’m not? I took a class in college – my one and only Philosophy course – entitled “Explanation” – and was immediately lost in a sea of questions. The professor with his PhD paced back and forth in front of rows of earnest young students like myself. Trying to absorb his explanations of deep philosophical questions and answers. The existential questions of…life? To me…it might as well have been another language all together. I had no answers for him that I understood, but I offered them anyway on exams….and assigned papers. Fortunately the answers were good enough. To earn a B in the class. I wonder how it would go if I were taking that class now…. This post inspired by V.J.’s Weekly Challenge #38: What’s In a Name? …what’s in a name? Specifically, your blog name. So how did I come up with…oneletterup? It was a process…a metamorphosis from one idea to another. I took that as a sign. To dig deeper. As this blog-to-be was just taking shape in my mind…and I surveyed the saved boxes of diaries, journals, stories – and old letters. 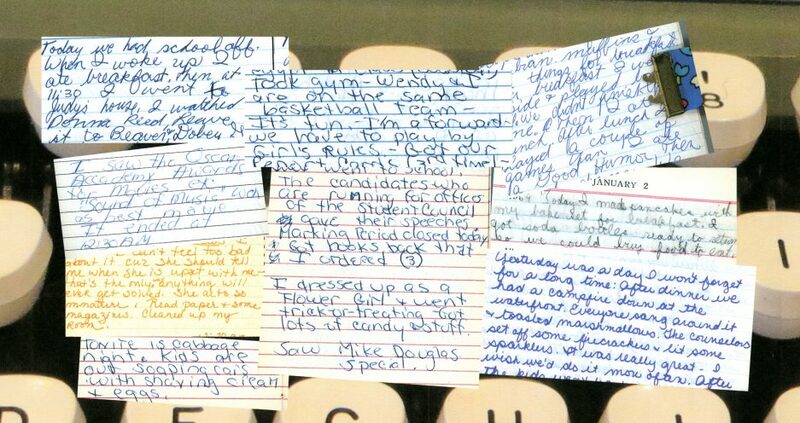 Especially the letters…hundreds of handwritten letters from as far back as when I was 7 years old. Precious pieces of everybody-has-a-story history. Letters from girlfriends, camp friends, grandparents, mother, father, sisters, brothers. Also, just as interesting, were the letters I had written to my parents…from camp, summer jobs, college or from the privacy of my childhood bedroom. Something…intuition I couldn’t ignore…kept me from throwing them all away. What do you need all those letters for? It’s all in the past anyway! However…the past – and its people – and their stories – are important. and (as I was to discover) the photographs that had piled up high. Source material? Inspiration? Family history? Because it was fun? And perhaps cathartic at the same time? I had already begun writing about my family and friends over the years. Sharing at various writing classes and groups. One short essay published online. For the most part, though, my life had been full of responsibilities pushing the writing down low, if not completely off, the list. Until a year ago. When I was ready. And strong enough to ignore all the discouraging voices…inside and out. …one letter up….at a time.